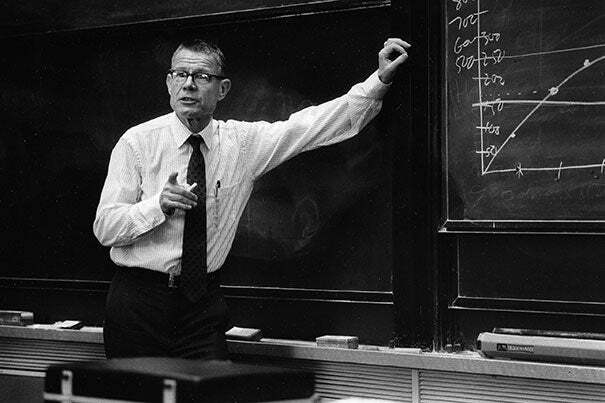 Nobel laureate Thomas C. Schelling, who was a major figure in shaping the modern Harvard Kennedy School, died at the age of 95. Thomas C. Schelling, whose pioneering work in game theory and understanding the “subtle tension … between conflict and cooperation” helped steady the Cold War’s nervous nuclear standoff, died Dec. 13. Among his many achievements, Schelling was a major figure in shaping the modern Harvard Kennedy School. In 1969, he was one of the School’s so-called “founding fathers,” helping design a new curriculum not for public administrators, but for a new generation of leaders literate in public policy. Schelling described the group of leading thinkers from around the School as “distinguished misfits.” The School’s core was a mix of political scientists, statisticians, economists, and decision theorists that included himself, Richard Neustadt, Philip Heymann, Howard Raiffa, Fred Mosteller, and Francis Bator. Before his Kennedy School years, Schelling also co-founded the Center for International Affairs in 1958, which was renamed the Weatherhead Center for International Affairs in 1998. The other founders were Robert Bowie, Henry Kissinger, and Edward Mason. The center was founded at the height of the Cold War, with much attention given to warfare theory and arms control research. There was little recognition of the field of international relations at the time. Schelling was always proud of the growth of the Kennedy School as well as of the proliferation of similar schools around the country. “I don’t think anybody ever anticipated such growth,” he said. Schelling was born in Oakland, Calif., in 1921. He fell into economics, he said, because the economics papers he read shared his way of looking at social problems as puzzles. He went to Harvard for his Ph.D. in 1946, leaving after his course work ended to work on the Marshall Plan and then at the Truman White House. (He wrote most of his dissertation at night, working alone, after he had finished his “day job.”) He joined the Harvard faculty in 1958, while also working at the RAND Corp., where strategic thinking was a priority. Perhaps Schelling’s most influential work was the 1960 book “The Strategy of Conflict.” The book focused, broadly speaking, on how parties that are ostensibly opposed can find ways to cooperate, said Richard Zeckhauser, the Frank P. Ramsey Professor of Political Economy, one of the many influential economists who saw Schelling as a mentor. Thomas C. Schelling was among the voices in the oral history project at Harvard Kennedy School, which was produced January 2014. Beyond his advice to Kennedy during the height of Cold War tensions and his efforts to diffuse them, such as the creation of what became known in popular culture as the “red telephone” connecting the Kremlin to the White House, Schelling’s influence made him a target for criticism. Some saw his fingerprints on national security policies such as the bombing campaigns in Vietnam and President Richard Nixon’s use of the “madman theory.” His power waned after he publicly opposed the 1970 invasion of Cambodia. Later, Schelling turned his attention to a wide range of policy issues, including racial segregation, traffic congestion, and climate change. His work on rationality and how individuals could control their own behavior led him to work on substance abuse and addiction. Schelling is survived by his wife, Alice, and by four sons. More than 900 students have been admitted to the Harvard College Class of 2021 through early action, a greater number than last year despite a more selective admissions process.